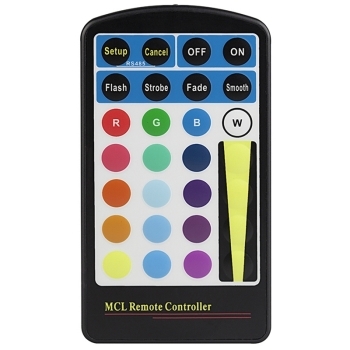 Spare UltraLuxx Remote Controller for use with the UltraLuxx RGB LED 18 watt spotlight. Supplied with CR2025 3V Lithium Cell Battery. On/Off; Switch on and off via on/off buttons. When switched on UltraLuxx RGB will immediately revert back to the colour or program to which it was last set before being switched off. Fixed Colour; Locked on any one of the 16 available single colour variants. Jumping Colour Change; Set to jumping cycle between different colours using the Flash setting (fast jumping colour change), Strobe setting (slow jumping colour change). Phasing Colour Change; Set to phasing cycle through different colours using the Fade setting (fast colour phasing) and Smooth setting (slow colour phasing). Brightness Alteration; Brightness can be increased and decreased via the 4 stage dimmer feature.